When consumers hear a recommendation from a service advisor based on vauge generalities like time or mileage they will invariably ask themselves; "How do I know if this is really necessary for my vehicle?" We believe that many (if not all) auto repair and service facilities conduct themselves with integrity and in accordance with the highest ethical standards, ensuring that any recommendation for service or maintenance is supported by a reasonable basis in fact. A real problem for service advisors however may be in understanding that without individualized vehicle testing a valid basis for recommending engine tune related services to a customer may not actually exist. How do you really know when your customers need engine tune related services? Some of your customer’s vehicles do not need any type of tuning service or repair but many other vehicles are operating with less than ideal combustion performance without you or your customer even realizing it. Performance and fuel economy often degrade over a long time period until symptoms are finally severe enough to understand there is something wrong. 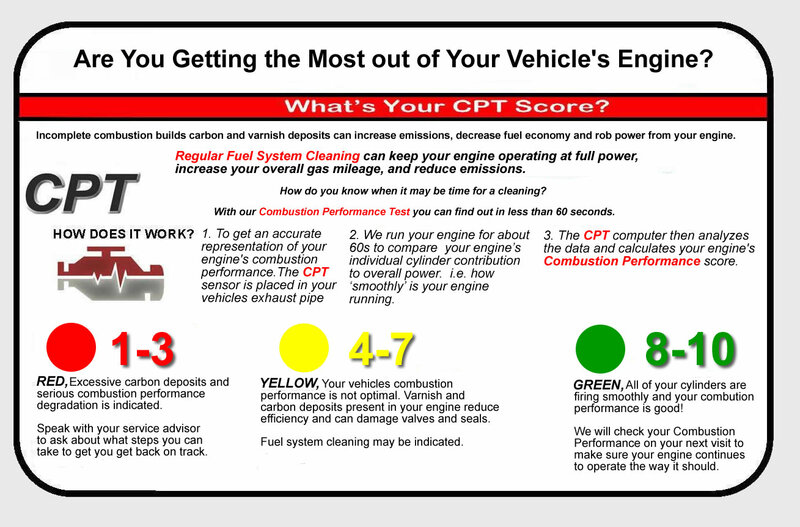 CPT takes the guesswork out of engine tune. Now you can provide your customers with a technical basis for recommending either preventative maintenance or remedial services with support for your diagnosis. OEM guidelines for spark plug and air filter maintenance are easily accessible for vehicles today as are OEM technical service bulletins (TSB’s) based on symptom or MIL code. Historically however, it has been very difficult to diagnose if and when a FSC service should be performed. In the absence of specific indicators to the contrary i.e. unrelated check engine light mil code or vehicle specific tsb’s, a fuel system cleaning may be the most logical and cost effective place to start to restore the combustion efficiency of your customer’s vehicle. FSC is a well documented, broadly performed and consumer recognized PM Service. Carbon deposits that accumulate on intake valves, injectors, ports, fuel injectors and combustion chambers can create loss of power, rough idle, hesitation, misfire, pinging, knocking, reduced fuel mileage, hard starting and also increases emissions. Removing the buildup of dirt and particles in a fuel system will help restore and improve a vehicle’s performance and fuel economy as well as overall drivability. 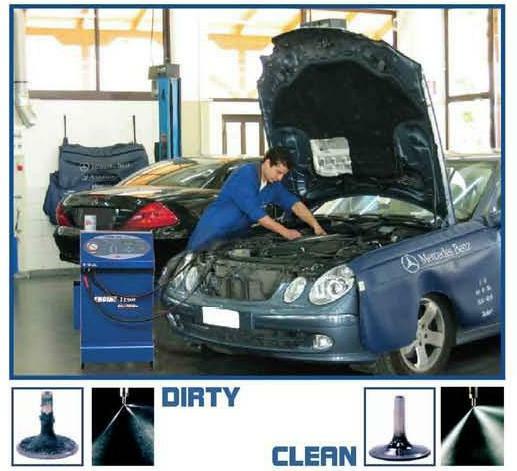 Poorly maintained vehicles with heavy carbon buildup may require more than one cleaning service to remove all carbon deposits. Unless a consumer is experiencing a symptomatic performance issue such as stalling, rough idle, sluggish acceleration, etc. – how does s/he know their engine may benefit from FSC? Since knowing when to recommend FSC is not always obvious OEM’s and their dealerships are in the same position as the automotive aftermarket. Recommendations for FSC rely on various supplier and/or trade-group supported time/mileage recommendations as well as the individual service advisors technical knowledge to convey service need and value. 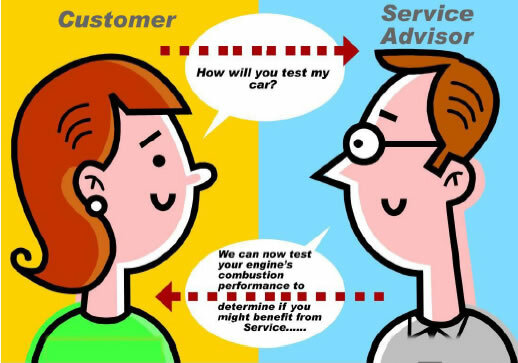 The test-before-recommendation system CPT provides can eliminate your service advisors making potentially untrue or misleading statements about the need for service.